Providing images for multiple designers and contractors involved in this build, my job was to bring out the best of the architectural design, build quality and craftsmanship, lighting and fixtures and also the bespoke furniture and kitchen design. The project was ‘filming ready’ the day before my arrival, but that meant that various contractors were back working on the finishing touches and tweaks whilst I was shooting, so there was lots of moving tool boxes out of shot, wiping surfaces of dust etc. Nevertheless, I managed to cajole the entire design and construction team and clients together for a couple of ‘group shots’ before they fled away from the camera like there was no tomorrow! Several hours shooting later, and a nip home for a recharge of batteries, I went back to the property to catch twilight. With the incredible accuracy of the Met Office forecast suggesting absolutely no rain whatsoever…. It was chucking it down! I may have been dampened, but my spirits weren’t, and with a short reprieve in the downpour, I was able to get some shots that presented the structure, render, lighting and setting beautifully, with the rain adding that lovely warm reflection from the wet patio. The project was a joy to work on, and the feedback I and the companies involved have received after seeing my images has been overwhelming. 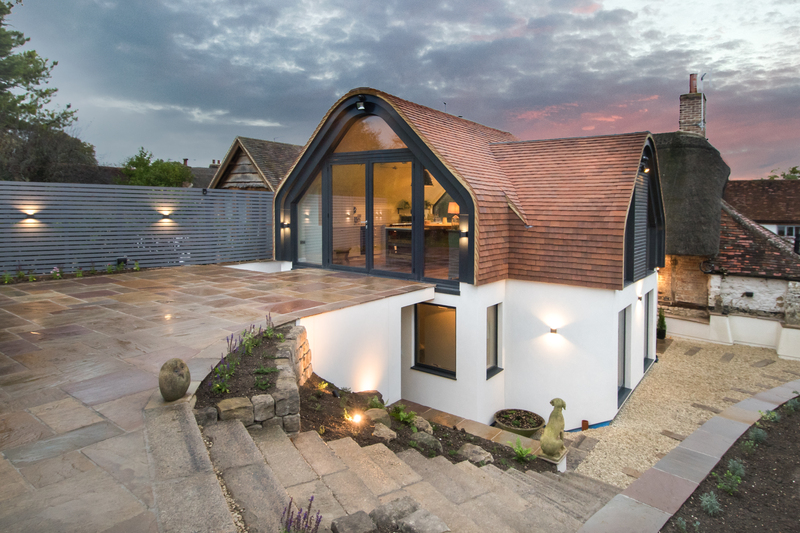 It’s projects like these that make me happy to do what I do, and continually appreciate the detail and vision required to transform something like this 400 year old grade II listed cottage into something so spectacular, yet practical and homely. Well done all involved!